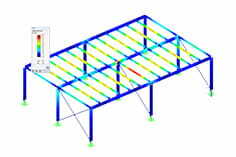 RFEM and RSTAB are able to cover a large number of branches in the field of building and construction industry with their generally usable structural frame analysis and FEM programs. 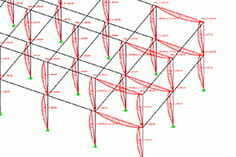 The design of cable structures is thus also possible in both software solutions. In the following, some assistance tools for modeling and design will be presented. A realistic initial form of the cable has a positive effect on the stability of the calculation. The effort for the "fine tuning" will be reduced as well until the desired final state is achieved. If the cable geometry is found for a uniformly loaded cable, relating to the true length, the catenary generator can be used. It can be opened by pointing to "Tools" → "Generate Model - Members" → "Arc...". Besides the numbers of members and the cross-section, the parameters of the catenary have to be defined. The heights represent here the distance of the nodes to the top of the catenary. The "parameter" corresponds to the radius of curvature in the vertex. Any section of the catenary can thus be generated. The cable geometry does not always correspond to the shape of the catenary. This is rather a unique case. In general, the cable geometry is related to the moment curve. A cable, which is, for example, only loaded by a single load in the middle, will form a triangular shape. If two single loads act on the cable, a trapezoidal shape will be the result. In case of an arbitrary loading and thus also a more complex shape, the RF-IMP or RSIMP add-on module can be used here. By using this module, the cable geometry can be shifted anologous to the deformation. In doing this, a model can be generated relatively quickly, which approaches to the searched shape. The methods shown above always define the initial state for the actual calculation. It will continue to deform due to the loads acting on the cable. Normally, the final state under load is however predefined. A certain sag will be exemplary under a defined load. The difficulty now is to define the initial shape which results in the searched shape with the applied loading. Without using form-finding tools, it is often only possible iteratively. A solution approach might be to modify the initial state until the searched sag is found. Modeling the initial state again with the above mentioned possibilities is an option, but due to the iterative process very cumbersome. Another option is to extend or shorten the cable by the member load "Axial strain". The cable will be extended or shortened and superimposed with the other loads. 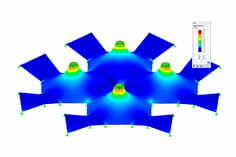 If the searched state is not achieved, another calculation step can be performed by modifying the "axial strain" again. If the desired sag is achieved, the initial length of the cables (function "Center of Gravity and Info") can be added with the modification of the lengths. The sum corresponds then to the unloaded cable length. At this point, the COM interface has to be mentioned. A specifically defined optimization routine, e.g. in Excel, could be linked with RFEM or RSTAB. RFEM with its RF-FORM-FINDING add-on module offers the possibility to find the searched shape under a defined load automatically. It is only necessary to enter the member, the loading and the searched parameters. The initial shape and the member divisions do not have to be defined in detail. After the calculation, the module graphically displays the found cable shape, the forces as well as the loaded and unloaded cable length. In the following, the options will be compared with each other. The sag of 100 cm is required here, for a cable with a bearing distance of 20 m under a defined loading. The manual option of a structure pre-deformed with RF-IMP (Structure 1) will be compared with the solution with RF-FORM-FINDING (Structure 2). Structure 1: The cable has been already pre-deformed 40 cm analogous to the deformation. Therefore, another deformation of 60 cm is required. The calculation results only in 6.1 cm. Therefore, the cable has to be extended. The related modification of the length has to be defined iteratively and results in 10.2. cm, which is uniformly distributed over all members. Structure 2: The structure 2, where the form-finding is performed automatically in the background, calculates an unloaded cable length of 20.12 m, so that it results in a sag of 100 cm under the defined loading. This result is identical with the manually determined values. Less effort is needed here, since the initial shape has only been defined as straight member and the whole iterative process is omitted. If it is about the design of cable structures, there are different ways to perform it in RFEM and RSTAB. The effort should always be estimated, which may result from a project. If more complex structures are designed, where also the stiffnesses of the substructures are inckuded or an interaction between the cables takes place, the work will become relatively quickly uneconomically. In such cases, RFEM with its Rf-FORM-FINDING add-on module offers a user-friendly and powerful solution.